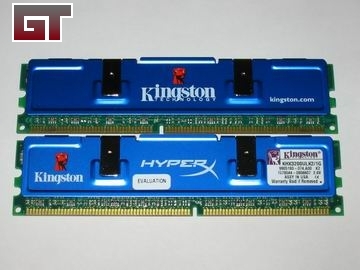 The long awaited low latency versions of the Kingston HyperX modules have arrived. We will be taking a look at the 1GB sample and see how it stacks up. 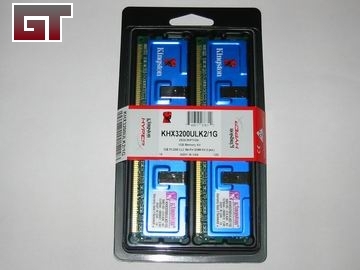 "Kingston's HyperX modules are designed for the avid gamers and PC enthusiasts who like to maximize the performance of their systems to allow for the optimization of memory parameters. With the lower latency timings, enthusiasts can take their systems to a higher level with the increased performance provided by HyperX." 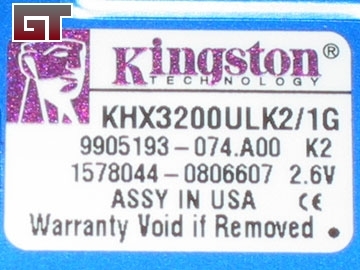 "Kingston Technology Company, Inc. is the world's largest independent manufacturer of memory products. Kingston operates manufacturing facilities in Malaysia, Taiwan, China and Fountain Valley, Calif., including Payton Technology Corp., Kingston's back-end processing facility supporting memory packaging, test and logistics. With the advent of Payton, Kingston supports all memory processing functions from receipt of wafer to completed module. Kingston serves a network of distributors, OEMs, and retail customers in more than 3,000 locations worldwide. For more information on Kingston, call (800) 337-8410, or go to www.kingston.com." This sample pack is basically the same as the PC4300 variety that we reviewed a month back. The major difference being that it is now CL2 rated! The timings have been beefed up to offer a stock SPD setting of 2-2-2-5. Whether you are running an AMD or an Intel based system, finding a middle ground where timing and high bus speeds will provide you with max performance. For our purposes we will be testing it out on a P4 system using a C series CPU; mainly because of the high bus ceiling. The modules come wrapped with the traditional Kingston blue heatshields. Although the heatshields do not actually provide any additional help in cooling, I guess any bit helps if it's there right?